Tone 12 is a day of Understanding. The IMIX trecena is a cycle of Inspiration, led by a Day Sign of “Light.” We embarked on a major new beginning, a new 260-day round of Human’s Transformation to Consciousness. Our Ascension from the round just completed, elevated us to a new state of mind, a new Consciousness and a Higher Spiritual Identity… the next generation of our Self. IMIX is the primordial Mother who knew us in the womb. We have been cared for under the hand of a Divine Mother, as we awakened to the world for the very first time. The womb is the place of darkness and the void, the place of all possibility. Our Spiritual Eyes were the first to be opened by a realization of Consciousness. In this place, a Dream is all we know. At our New Dawning, IMIX is helping us to Define our Spiritual Identity. The wild ideas and thoughts that IMIX sends out of the blue, was a Voice we could recognize as Divine Inspiration. IMIX made it possible to Know we were connected to something more powerful than our Self, a Consciousness that would be with us from the beginning to the end. We enter a world of Consciousness without any direction of movement. IMIX guides us to Innovate our Life, and to Believe from the beginning that we are capable to make our Dreams Come True. Road/EB is the Day Sign also known as Human. The glyph illustrates the “road of destiny” on Human’s head. The glyph reminds us that our destiny is a Human Responsibility. Who we will become will be defined by all the Choices we make. Given Free Will, all the Choices are up to us. All the Choices are up to us. That’s the very first thing that IMIX would want us to know, that we can Choose Anything we can Dream. 12 Road/EB seats this Understanding in our Heart. We were Awakened as a Spark of Love, the One Divine Consciousness. So were we make capable to Create Love. As Humans we would be empowered to Create the “Experience of Love” by manifesting a Dream. As the Awakening of Spirit, IMIX is all about Human’s Higher Self. Our Spiritual Identity is the Divine Element of Human, the Ether that is One with the Power of the Creator… the One that Knows All and Sees All. This Spark is the most important part of who we are, the first to wake up. The IMIX trecena presents a doubled-effort, a collaboration between the Above and the Below. The 1st uinal represents Unity of Intention to carry out the process of impregnation and germination of the new Seed of who we are. Master Number 11: The 1st trecena in the 1st uinal represents the Master Number 11. The Master Number 11 is a symbol of new beginnings, and a “wake up call” to our Consciousness. This is a prevailing energy of this trecena of Master Numbers, with each Tone number doubling itself by the number of the Day Sign’s position. 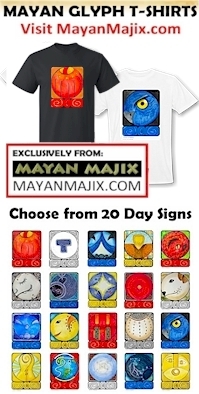 The 20 Day Signs are the archetypes that illustrate different perspectives of Consciousness, different aspects of personality with different ways of approaching an Intention of Creation. They are defined by the calendar in chronological order by our “need to know.” IMIX is the Alpha and AHAU the Omega. IMIX’s guidance to use our imagination to Dream our Dream, is the perspective we needed most to fully awaken our own Consciousness with a purpose for living. 12 Road/EB elevates us to the Knowing that our Dreams will be co-created through the help of Divine Intervention. We can have Faith in a Power Greater than our own. We can see our Divine Destiny as a Revelation that lies in our future. Through a Spark of Consciousness, we’ll have something to hang on to, a Light that Shines the Way. We can Imagine the Dream of a Divine Creator, One who wants us to Know How Much We are Loved. A Divine Dream would be that we manifest a Creation we saw as Humanly Impossible, so we would Know the Presence of a Divine Hand. We were created to experience Miracles manifested in the world Below. Road/EB reflects on the Truth that Human is the “bearer of time.” To Know the Fruit of our own Harvest, we must proceed through the darkness of the Unseen. It takes time for our Miracle to manifest. We will pass the seasons before the next 13 Sun/AHAU, and our next big life-changing Miracle. The Creator Knows the Human condition and the difficulty that lies in waiting. The “road of destiny” on the glyph is shown with milestones on either side. Each trecena offers us a “milestone of initiation.” Each trecena we will become Conscious of something new, small Miracles of Understanding that may seem barely discernible, but enough to help us bear the time, the time that’s needed to Transform our Faith into a new Belief. The Cherokee Day Sign the Rattlesnake Tooth is a symbol of Spiritual Medicine. This is a day of Spiritual Healing. Our Spirits are made Whole. The Rattlesnake Tooth was used by the shaman to break the skin in a Ceremony of Healing. It left a mark to Remember. This is a day to mark our own Milestone of Consciousness, a day when we arrived at the Consciousness of our Unlimited Choices, and the Power of Love for us to see it through. Through a new Understanding, we’re prepared to make the Choice for a “Leap of Faith,” starting over with new Consciousness of the Powers of our Higher Self. To all my relations, may we be Inspired to Begin our Lives Again, holding Faith in Dreams we were once afraid to believe in. May we be willing to take new chances and push beyond our own Known boundaries as if nothing is beyond our reach. May we hold Faith in the Divinity of the One. May we recognize the Spark within ourselves is our piece of the Creator, and Understand that to Know the Creator is to Know our Self. May we imagine all the things we could manifest with the Power to Create a Miracle. May we mark this day as a Milestone, the Dawning of a new Spirit and the Day we First Chose to Believe. I’m grateful that we were Gifted with the Consciousness to Know our relationship with the Creator. REPORT ON THE GARDEN: This is a good time to initiate new projects that require time. My balcony is the “garden” I tend as Human as a material expression of an Intention of Spirit. We’ve had glimpses of Spring, though cold wet weather has been hanging on. I began my first effort with some plantings of primrose that prevail through most of the summer here. The House Sparrows with red feathers mixed with brown on their head – tiny birds – have been active, along with the Red Wing Blackbird that whistle an extended tone. I wish you could have seen it when I started in 2015, the year I launched this journal. The balcony was only a collection of things “undone.” The balance is a human effort that’s changed my life. 3 summers later, it’s starting brand new after a building powerwash. The birds had to take a little vacation from my feeding until the smell of clorox was gone. They seem happy to return to a place with flowers. Their activities happen within a few feet of view through the sliding glass doors. There’s been quite an accumulation of species. I know their voices now when they announce their arrival. I imagine how I could now take a walk in the woods with a totally different experience, knowing the living things around me. An effort of Human in the Below is equally able to manifest a Gift to Spirit Above. We can create our own Human miracles.